Results: 1 to 10 of a total of 126 results. freedom from want I believe that our world has enough resources to feed, shelter and clothe everybody and that our system of creating shortages of necessities is very destructive to the human spirit. I'd like to chat from time to time with others who want to help bring the world closer to socialism. (I'm also open to some other system to replace capitalism, if someone comes up with something better than socialism.) 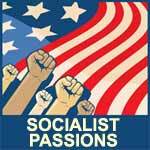 I found Socialist Passions by typing in "socialist chat room" on goodsearch.com--a search engine the user can set up to donate to any charity on its list with every use. Does dana9 belong in this group? Does medici7777 belong in this group? Asexual Celibate I'm a 41 year-old college student who is using this time of my life to do all of the things that I should have done a very long time ago. I am also an asexual celibate. Does peterson515 belong in this group? Sincere, down to earth, caring, supportive, likeable, GSOH, enjoys life and also conscious of life's injustices and need to counter them. Does roy4u belong in this group?